View of the space from the SE corner. 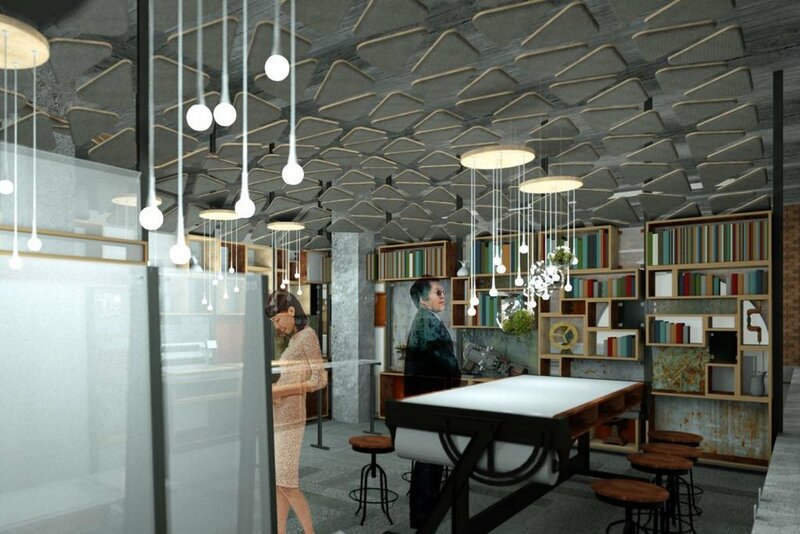 This 'coffee house' was designed for the interior of an existing office space. The design is endlessly reconfigurable, as they wished to rearange the space once a quarter to keep the staff engaged. View of the space from the NW corner. Designed as an internal promotional space where staff could engage, experiment with and show off physical and digital pieces they had designed with the company's products. View of the space from the NE corner. The walls of this space not only fit into the existing office space, but can be quickly taken town & rearanged by the facilities crew. View of the space from the SW corner. The furniture within the space is also designed to be multi functional and much of it is part of an overall interactive design concept as a larger vision of the space. The reconfigurable walls that make the perimeter of the space can be stacked in different versions to allow easy and quick reconfigurations. The floor plan has been designed to be endlessly redesigned. We provided a few achievable examples. Another floor plan. Showing a much different feel from the last. This ability to redesign the space easily keeps in new and exciting for the staff, spurring conversations and sparking new ideas. Like most large companies, Autodesk is always looking for ways to engage internal staff within a context of their product. 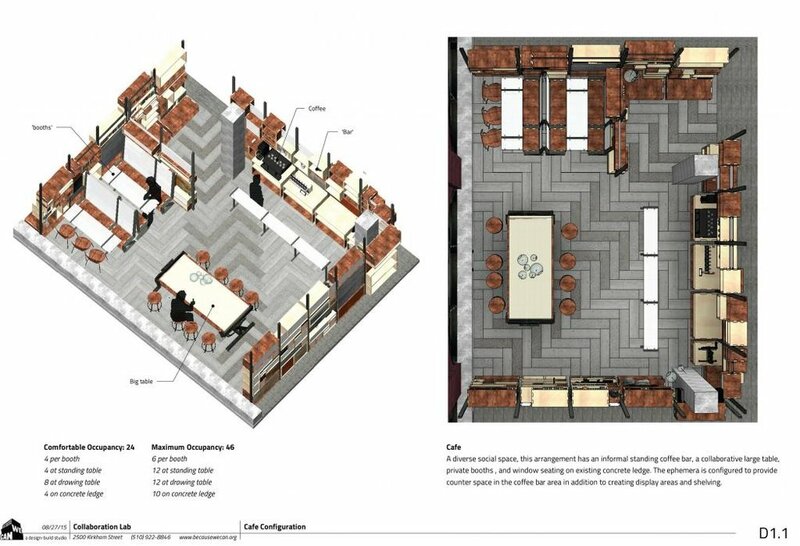 The idea here was to create a multi functional space that would act as an internal cafe & casual meeting point, but have more going on that just a passive space. We played with ideas around RFID tags and QR codes to mark items that were created with their products by staff. Concepts around voting, "up liking", and other internal contests that would be based on internal teams, departments or groups. The space would then be reconfigured ever quarter, or twice a year, to keep people engaged. 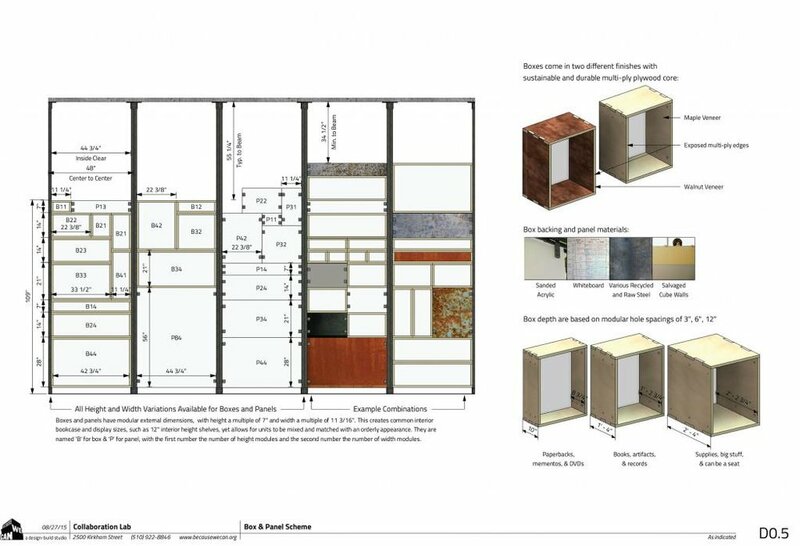 This meant we had to not only create the concepts around how people would interact with the space, but also create a 'kit of parts' that the space is created from that would be easy to redesign, disassemble and reassemble by internal designers and the facilities staff.